Luxair is the nationally held airline of the country of Luxembourg (39.04% ownership), officially known as the Grand Duchy of Luxembourg. Luxair is one of the smaller operators of the Q400 turboprop. As apart of their fleet, Luxair operates 10 Bombardier Q400 Turboprop airplanes as part of their flight operations. On October 3, 2013, Luxair ordered 1 more Q400 aircraft bringing their total Q400 fleet up to 7 from 6 aircraft. The airline also has an option for an additional Q400 aircraft order, which would bring them up to 8 aircraft. Luxair's Bombardier Q400 are equipped with 76 seats in a one class configuration. The seats are configured in the typical 2 by 2 configuration for the 76 version of the Q400. This should yield a seat pitch of 30 inches. Above Q400 Luxair photo by Milad A380 on Wikimedia Commons, Modified by FlyRadius. Photo (only) released under a Creative Commons License. Below is a small seating chart of the Luxair Q400 with 76 seats or actually 72 seat seats. The seat map that Luxair is using does not have the correct amount of seats in it. More seat maps of the aircraft can be viewed here on the Q400 Seat Map / Seating Chart page. 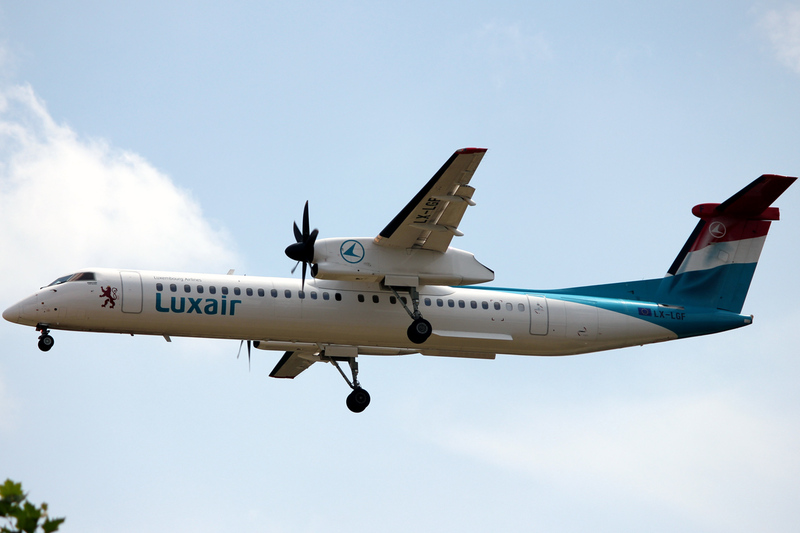 Luxair flies the Q400 from their hub in Luxembourg to many destinations in Europe. The Bombardier Q400 is used on short haul, regional flights that only need 76 seats. The Q400 aircraft is built by Bombardier Aerospace in Toronto, Canada. Entering into commercial service at the end of 1999, it is the newest version of the Dash-8 series aircraft. Bombardier built the Q400 to fly fast, be quiet and to be efficient. The Q400 has many improvements when compared to previous turboprops. One of the important improvements is that the Q400 propellers and noise reduction system help make the Q400 quieter then other turboprops. The plane can seat up to 86 persons, however as mentioned before Luxair has chosen the 76 seat configuration. To learn more about the aircraft itself, visit the other Q400 pages here on the site. Bombardier DH4 airplane Luxair: "DH4" is the Q400s IATA code that is primarily used by airlines to identify the aircraft. Learn more on the DH4 page. Bombardier DH8D Aircraft Luxair: "DH8D" is the ICAO code for the airplane and is used by airlines, air traffic control and others. To learn more about this name visit the DH8D aircraft page. De Havilland Canada DHC-8-400 Luxair: This is the model name for the turboprop. De Havilland was the previous division of Bombardier that built the aircraft. The De Havilland name is no longer used in marketing by Bombardier, so it is called the Luxair Bombardier DHC-8-400. DHC-8-400 is the official model name for the turboprop that is used by aviation regulators to identify the aircraft. De Havilland Dash-8-400 Luxair: the Dash-8-400 name is the name that was previously given to the aircraft by Bombardier. The Q400 was apart of the Dash-8 series program of turboprops. Bombardier then decided to change the name of those aircraft to the Q series turboprops and the Dash-8-400 became the Bombardier Q400. More on the Dash-8-400 name is found here.